The success of China’s reform and opening program across 40 years has shifted the nation from backwater to the centre of global growth, lifting 800 million people from poverty in the process. A largely complementary economic relationship has meant Australia has enjoyed a record-breaking prosperity run. For African economies, however, China’s emergence has had more mixed effects. Until recently, resource-rich economies on the continent enjoyed the China boom, but resource-poor economies had suffered an industrialisation double-whammy: being out-competed in low-cost labour-intensive manufacturing, and enduring inflated commodity prices also. Yet as I detail in a recent article for Bridges Africa, a new development window is opening for today’s poor and demographically young countries. Importantly, not only China should heed that shift. When China embarked on its economic reform and opening program in 1979, it was already almost a decade into what it known as demographic transition – the shift from high birth rates and mortality to low birth rates and mortality. The result was a rising working-age population share (shown in the chart below), that delivered a demographic dividend for more than four decades. A demographic dividend offers a transitory window for a developing country to enjoy rapid industrialisation. However, this only takes place when labour is effectively and incrementally transferred from the informal rural sector into the formal industrial sector – a process that takes place without wage inflation for as long as the new entry of informal labour remains available to the industrial sector. In economics that process is captured in the Nobel Prize-awarded Lewis Model, and was broadly followed by China for almost four decades. Fortunately for China, the export-led industrialisation program coincided with the arrival of the high-income “Baby Boomer” generation across the West and Japan. That is, a roughly several-decade high-wage demographic dividend met a low-wage economic dividend, and an era of complementary growth ensued. The demographic dividend party, however, roughly ended around the time of the Global Financial Crisis of 2008, in China and in the West. In China’s case, the exhaustion of informal labour (migrant workers) to newly transfer from the rural to the industrial sector and population ageing mean that China is gradually losing its remaining low-wage advantages. It now faces an uphill journey to reach its goal of entering the high-income group, as well as prospective tensions with the world’s major economies as it becomes competitive in industries that had over earlier years been the more exclusive domain of high-income countries. Alongside seizing new opportunity in advanced manufacturing and services, Chinese policy makers also now seek to take advantage of cross-country differences in the timing of demographic transition and development. The four-quadrant Economic Demography Matrix (EDM) presented in the table below provides a simple framework for conceptualising the underpinning landscape transformation in terms of global economic demography, and its potential to better complement long-run African development. This table highlights the four elemental demographic and economic circumstances: poor and young; rich and young; rich and old; poor and old. Advanced demographic transition has moved China out of the “poor and young” quadrant and into the “poor and old” quadrant. 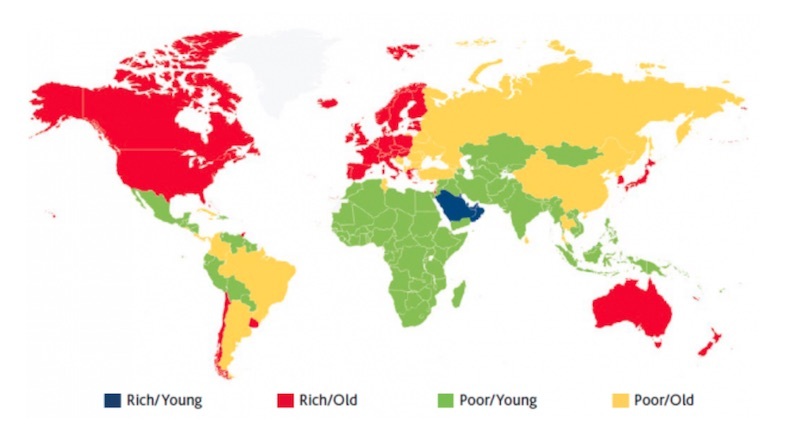 The majority of remaining “poor and young” economies, as illustrated in the map below, now sit in Africa and South Asia. In response, China seeks to allocate some of its vast savings out of contemporary low-return bonds and into the long-run potential of emerging low-wage industrial potential in what are now “poor and young” demographic dividend “frontier” countries. This relates to the fact that “poor and young” countries offer low wages, and depending on demographic transition stage, some of them prospectively sit on the verge of an era of low-wage industrialisation and rapid productivity returns, as did China from the 1980s. China’s rising foreign aid and expanding array of concessional lending institutions and instruments are being geared to support this agenda, including and especially under its flagship Belt and Road Initiative (BRI). For China this not only offers leadership in global development and the potential investor returns, but also an incremental opportunity to internationalise its currency and financial sector. While Chinese officials emphasize the BRI is a global initiative, its global development focus is integral to the initiative, which was launched in 2013 in Kazakhstan and Indonesia – two “poor and young” economies. The intensive cluster of “poor and young” countries in Africa, and the relative need for infrastructure to help unlock new growth, mean that China’s new model of growth has vast potential to directly and indirectly better support African development than did China’s earlier labour-rich demographic dividend era. In September, leaders of China and most African nations will gather for the seventh triennial Forum on China and Africa Cooperation (FOCAC) summit, this time in Beijing. FOCAC is the platform under which ministerial meetings and working groups between Chinese and African governments are arranged. The Action Plan from the last FOCAC summit, in December 2015, is available here. Hosting FOCAC in 2018 offers China a symbolic occasion – the 40th birthday party of its reform and opening – to progress the People’s Republic’s long-standing promise to use its own developmental success to aid the development of other poor countries. This dates to the Mao era but was prominently reiterated by Chinese President Xi Jinping at the World Economic Forum in Davos in 2017. China’s new model of growth has vast potential to directly and indirectly better support African development than did China’s earlier labour-rich demographic dividend era. Little is known of what will be discussed and announced at this year’s FOCAC Summit. It might be expected that China will announce new contributions to developing the human capital of Africa’s youth via scholarships and investing in educational infrastructure; and also new funds for infrastructure and “industrial capacity cooperation”. With many African countries themselves sitting on the edge of a nascent demographic dividend era, it is also possible that China will offer funds toward sharing lessons in how China captured its demographic dividend era for its own rapid industrial development. This is a time of transition, when frontier and less resources-driven African countries, such as Ethiopia, are emerging as potential candidates to take over the position that China long occupied as the global “poor and young” economic engine and “factory of the world”. Subject to technology shifts and broader trends of the world economy, along with the appropriate institutional environments in African economies, Ethiopia may ultimately become an African equivalent in the decades ahead. This implies a lucrative potential for reaping the productivity gains of a growth process of the kind described by the Lewis Model, and expanding markets in Africa in general. And hence, this year, as China celebrates 40 years of remarkable economic progress the 2018 FOCAC summit presents a critical opportunity for African and Chinese leaders to discuss the case for mutually beneficial trade, investment, and aid opportunities to support mutual development. Given population ageing across the West and Japan, and the returns the West and Japan gained from investing in China’s demographic dividend era, it is also timely for other countries to re-think their Africa policies also. Despite the joys of connectivity, nothing substitutes for simply being there; for having the time and money to go into the field.